A fourth person has died in hospital after the attack yesterday on the Jewish Museum in Brussels. A woman lays flowers at the Jewish Museum. Belgium’s Jewish community was placed on high alert Sunday as police hunted down a gunman who shot dead four people at the Brussels Jewish Museum in an attack blamed on growing anti-Semitism. An Israeli tourist couple and a French woman died from gunshots to the face and neck after a man apparently acting alone fired two successive rounds into the museum on Saturday afternoon before escaping minutes later on foot. A fourth victim, a Belgian who did volunteer work for the museum, was critically injured and has died this afternoon. The first such attack in more than 30 years in Belgium has revived fears of a return of violent anti-Semitism to Europe, with Israeli premier Benjamin Netanyahu notably lashing out at Europe’s “hypocrisy” in its attitude to the Jewish state. A picture of the suspect is to be released to the public shortly, Van Wymersch said. French President Francois Hollande, who along with Netanyahu had a phone conversation with the Belgian premier, said he had no doubt about the “anti-Semitic character” of the attack. The attack in the busy heart of Brussels, minutes away from a packed streetside jazz festival, came as the country headed into a crucial general election held alongside a vote for the European parliament. Email “Jewish community in Belgium on high alert after attack that left four dead”. 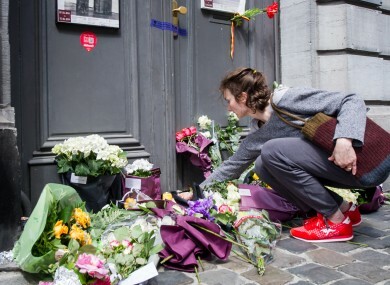 Feedback on “Jewish community in Belgium on high alert after attack that left four dead”.